...get involved to ensure the sustainability and viability of these important parts of our communities. 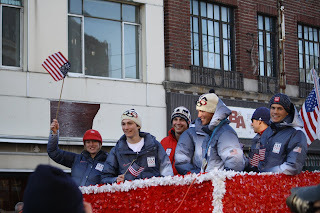 This April the 2010 Winter Olympians will be visit the White House and President Obama, and some of us will extend our trips to support causes that are important to us, not just as Olympians, but as people who are invested in supporting that which is important to us and our communities. Bill will stay to help celebrate Earth Day in the National Mall. My self, on the otherhand, will arrive early to visit local Washington, D.C. schools with the USOC's Team for Tomorrow. Currently, the Olympic Regional Development Authority (ORDA) is facing severe state budget cuts. Fellow Lake Placid Olympians are lobbying for support, and concerned citizens are writing letters as the state budget is posed to pass this coming week. This is a huge issue not only facing athletes in the Adirondack region because ORDA is a primary vehicle for events and tourism in the North Country. Check out these articles and send in your letter! Chandra Crawford's (2006 Canadian Olympic Gold Medalist in skiing) program Fast and Female was brought to Madawaska today via our top US nordic skiers and biathletes. We put aside our race bibs today and dawned SKIDA hats, ISIS vests, handmade name headbands and formed little teams of girls from the Madawaska Elementary School and surrounding towns like Presque Isle and Fort Kent. The mission of Fast Female is to unite girls, give them a fun and encouraging experience on skis, and inspire their confidence and journey to reach their own goals. 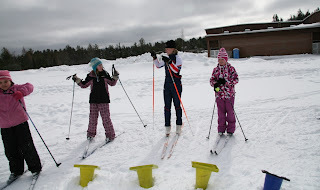 The participants range from 9 to 19, and the instructors range from local skiers and moms, to elite club skiers, National Ski team members and Olympians; together it forms an invigorating nordic love fest and demonstrates all sorts of reason to get into nordic skiing if you live in cold wintery places like northern Maine. 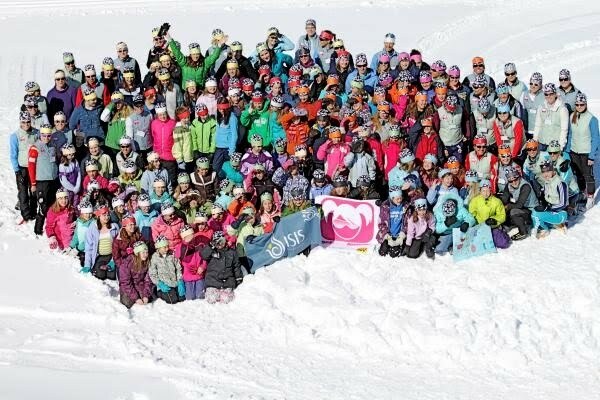 Not only that, when asked why we love to ski, many of us cited to that it is a healthy and lifelong sport that keeps your body, mind and heart strong and dominating. Kikkan Randall kicks off the morning with an inspiring talk. Then we head out to the soccer field for a game of sharks and minnows, obstacle courses, ski technique, sprints, and a couple downhill course where our speed was clocked with a radar. I took a hot chocolate break with Noelle and Grace. The elementary school is just down the road from the Four Season Trail center where our weekend races will be held and tomorrow's classic race will be my first in many years. Teammate Susan, a fellow Fast and Female instructor, and I waxing up before our ski. The stadium and newly built Four Seasons lodge. 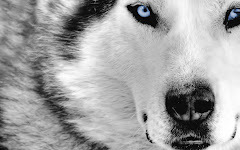 Northern Maine is unique place, and after spending a few years here with the Maine Winter Sports Center, it is also a place that I am very fond of. 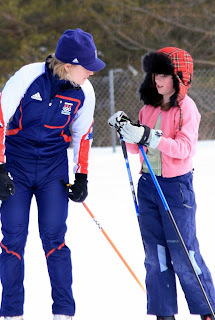 I just came across an article by Bill McKibben about the impact of nordic skiing and biathlon on Maine's Aroostook County: "The Maine Way: Aroostook County, Maine Winter Sports Center reawakened a skiing heritage" It offers a good background on MWSC, a glimpse into the inner workings of using skiing as a successful economic vehicle in this part of the country and a taste of the local culture. Over the past three weeks the County has hosted XC Junior Olympics, US Biathlon National Championships, US XC Long Distance 30/50km Championships, and soon the SuperTour Finals. 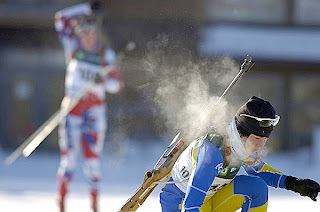 Looking ahead to next February, Fort Kent will host its 2nd Biathlon World Cup. The 30 and 50km marathons were this morning. As I knew it would be, I really enjoyed racing the 30km. And after last week it was nice to start each 10km lap without a penalty lap handicap. Photos will come soon, as the snow piles up and the wind blows as if it were mid-winter, not the end of March. Sunday marked the official end of my biathlon competition season with the Mass Start and the first day of spring with a sunburnt face. I was really glad to be here for US Nationals and to get a chance to race some low key races on a former "hometown" course. After a great week of training at home and a solid lead into the race week I really enjoyed the first race. I gave my self the best chance of putting together a good race series, but the length of the race season, the heights of the Olympics and the lows of poor performances have really tested my ardor for competition this season. Coming back to the County was the right place to be to rekindle my enjoyment for racing and ending the season on a good note. Despite some tough races this week, it was in those trying moments that I found that there is still a lot of work left to be done. After some fun xc races this week and a healthy spring break, I will get another chance to pick back up where I have left off. Racing resumes this Wednesday with the US Distance National 30km and 50km skate race. Today was a training day in between yesterday's Sprint and tomorrow's Pursuit, and a good day to take advantage of freezing temps overnight and clear blue skies this morning. A huge crew ventured up to the open, frozen fields on top of the Perley Brook Roads to ski on the perfect spring snow crust. The effortless and open range skiing was a nice change after racing in slushy conditions in yesterday's sprint. Melinda and I skiing through the birches. North American and US Biathlon Championships will continue this weekend with a Pursuit and Mass Start. An eagle on the streets of Vancouver during the Games. Fort Kent, the northern most town in an area affectionately known as "The County," was my home for a couple of years while I skied on the US Biathlon Development Team and for the Maine Winter Sports Center. It is great to be back up here to finish out my season with US Biathlon National Champs and US XC National Champs. Not only is it nice to enjoy racing after a long Olympic year, it has also been invigorating to catch up with old friends and loop back through one of the places that was integral to my ski career. I'll be sure to get some photos up here soon, so stay posted for another update. Since I've been home I've been skiing with a bunch of local kids - during their school recess, regular Bill Koch and Dewey ski practices and out at our local ski areas - Mt. Van Hoevenburg and Dewey Mtn. I had enough bibs when I skied with Pat Gallagher's Bill Koch kids for each one of them to get to ski with a World Cup or an Olympic bib. I've been connecting with the Lake Placid Elementary 4th grade class all year and this week I got to join them for a ski during gym class. In addition to skiing around the soccer field they taught me tennis ball biathlon. And we also chatted a lot during our skis; the weather was gorgeous, blue skies and sunny, and way more fun than sitting inside. And then, our communities got together and hosted a parade for local Olympians! All together it was a pretty awesome first week at home. Its been a week since I arrived back in Placid and I am finally sitting down to sort through some photos from the past two weeks. I am psyched to be staying stateside for the remainder of the season; its been a long and tiring year for me and I am just really glad to be home. Next week I will travel up to northern Maine for US Biathlon Nationals and US National Distance Championships (30/50km) /USSA SuperTour Finals. All races will take place in Fort Kent and Madawaska. Snow is low, but it will be a fun way to end the year. Below is a bit of a scrambled montage of my final week at the Olympics (starting from when I arrived home). Once our Relay ended (two weeks ago!) I got down to Vancouver to check out the Olympic Cauldron, women's 5000m speedskating final, and downtown Vancouver. Back up in Whistler I was also able to take in our men's relay, Billy D's gold medal event, the women's 30km, men's slalom and the USA/Canada gold medal hockey game all before Closing Ceremonies which in a very Canadian way brought an end to the Games. This is what happens when I get back home after being on the road for 3 1/2 months. My self, Liz Stephen, Kikkan Randall and Simi Hamilton after Closing Ceremonies- these guys hopped a plane to Finland for a week of World Cup racing the following morning. Canadian Carnival at the Ceremonies. When we got to our seats after walking in everyone discovered their pair of moose antlers and promptly put them on to the dismay of the volunteers who painstakingly tried to get us to use our props at the right time. This was actually the time we were supposed to be wearing them. Bill Demong holding our flag during Closing (sorry my camera skills were not on, I was a bit distracted and in awe of it all). Jeremy and I primping our driver's hats before Closing. Team USA bedecked in Polo; if you lost your crew it was kind of hard to spot them again. Teammate, Lanny and I walking in. What was one of the sweetest things of the Olympics? This. We got to check in our multiple pieces of very heavy, very large luggage with United at the Athlete's Village. They set up a temporary check-in for us to make checking in to the small Vancouver airport the next morning easier. They even told us to arrive 4 hours before our flight! I talked to one alpine skier and he hauled a whopping 17 bags through! The boys standing proud before the USA/Canada game. Jeremy sporting his 1980 Lake Placid jersey. ...among a sea of red. Hats of to Canada - they played an excellent game. Our hallway by the end of the Games in the Whistler Athletes Village. The biathlon, ski jumping, combined, and xc teams all stayed on this one floor. Should have zoomed in, but here is Tim being cheered on by Ed, our team doctor and token course supporter, during the Relay. A commemorative 2010 nordic coin. I made it to the Olympic Cauldron just after dusk. This humble glass torch is memorable and I think this waterfront park will be neat to visit again someday. My view at the women's 5000m Final in the Richmond Oval. An American is racing on the right side. Soda bottles - General Waste - Compostables - Plastics. The Europeans were a bit slow to catch on, but I hope this system, which is prevalent all throughout the city caught on to all Olympians. The 2010 Vancouver Nordic poster. The 2010 Vancouver Biathlon Poster. I had a lot of friends and family in Vancouver, and not only can you check Kara's site www.haleykaralars.com , but my little cousin Rath also set up an Olympic Blog - get to it from here.